Today we launched a new Permission Management portal for our certified partners. It’s now easier than ever to control who has access to all your client accounts. Assigning access and permissions to client accounts starts with creating a team (even if it’s a 1-person team). If you’re a broker Partner, you may have one team in charge of building out new implementations and a separate team for processing enrollment changes. If you’re a smaller partner, maybe you only have one team that does all of this. GoCo gives you full flexibility to organize the responsibilities however you see fit. 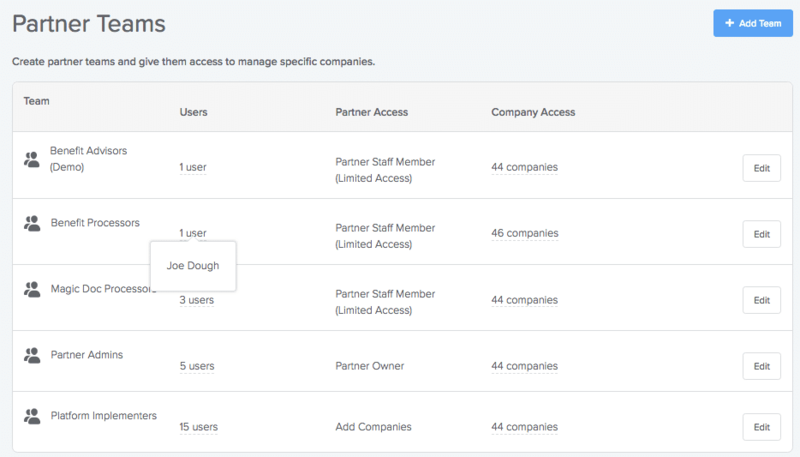 The Partner Teams page gives you a birds eye view of your current users, the teams they’re in, and the companies they have access to. In the example above, I’m making this Team a Benefit Processor for a company called Bob’s Burgers. If you need to invite a new user to a Team, just go to Partner Teams -> All Users and click the “Add User” button. You can either assign the new user to an existing team, or create a new team to put the member in. The invited user will receive an email to join your organization. If your organization has many client companies, it may be helpful to organize them into categories. You can think of a category as an optional “tag” that can be used for filtering and reporting. A company can be in multiple categories at the same time. A large brokerage may want to organize their companies into categories like “Texas”, and “California”, or perhaps “VIP” for your most important customers. We allow our partners to connect with other partners to “outsource” some of their services. A common example of this would be a Brokerage outsourcing the COBRA processing to another one of our certified partners. Please contact us to learn more about leveraging our connected partners. For company HR admins, we’ve given them more transparency on which Partner Teams are helping them administer their benefits, payroll, and magic documents. 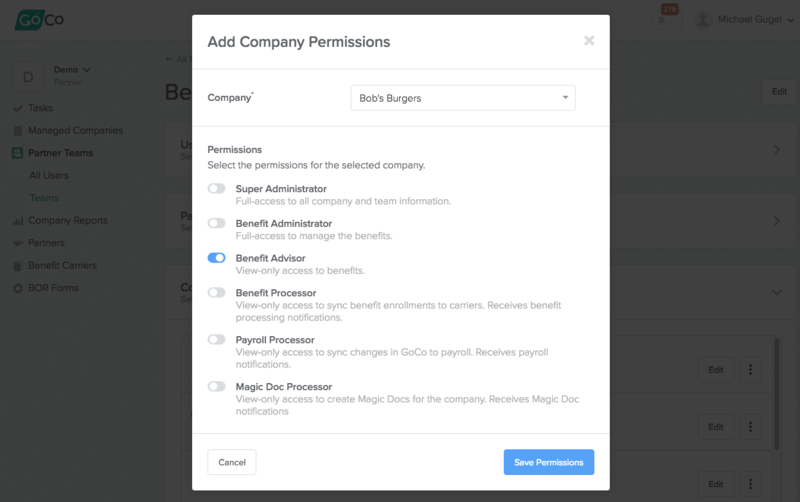 That’s available by going to the Company dashboard and then clicking on the Company Permissions card. 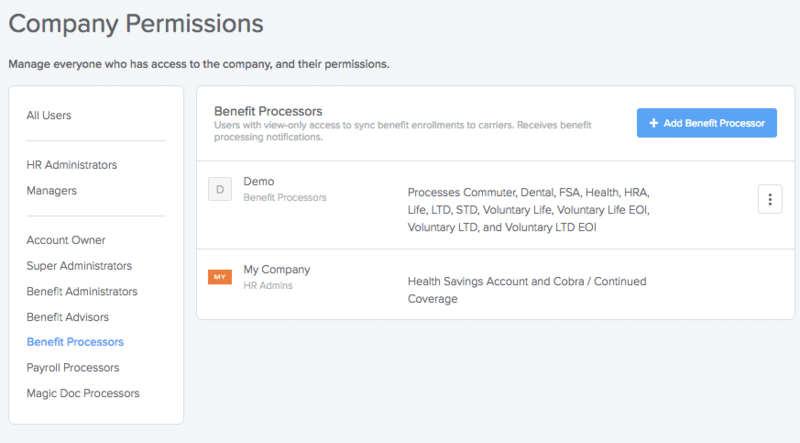 In the example above, a partner called Demo has a Team called Benefit Processors that are processing benefit enrollments.